In July of this year I had the opportunity to do some teaching up in Virginia. Based on the success of my previous teaching trip to Roanoke, the non-profit organization Young Audiences became interested in working with me on another project. This time Nikki was able to join me as we drove up to Norfolk where I taught two manga and anime art related workshops as part of the Arts for Learning Residency program. The whole point was to get the students to think about sequential art, or how to tell stories using images. 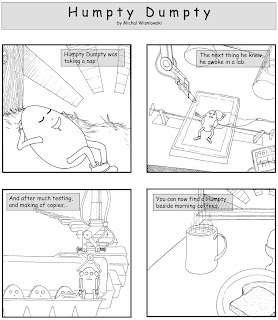 Our starting point was the story of Humpty Dumpty, which the students were to reinterpret and retell. As an example, I created my own version of the rhyme and drew up four panels illustrating it. A task that the students were also given and completed in groups. While our groups were a bit smaller than expected, I think that everyone who attended was very enthusiastic and had a lot of fun in addition to having come up with some great results. After two consecutive workshops of this nature I now have a better understanding of how to approach this type of teaching situation and will undoubtedly make improvements to this format in the future. Chances are I will be working with Young Audiences again when additional projects come around and I look forward to it!